The answers to frequently asked questions can be found here. Your question is not listed? Send us an inquiry. Do erixx trains accept the BahnCard? The discount is granted to the extent necessary (25%, 50% or 100%) for journeys outside the transport associations. 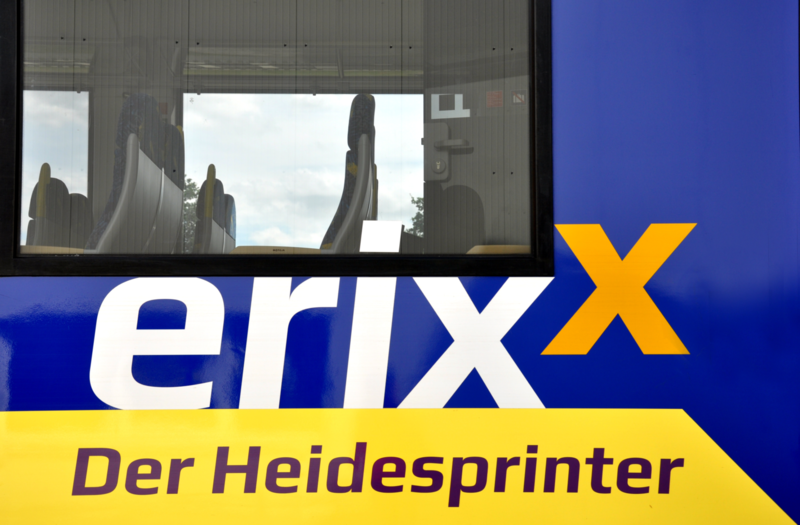 Do erixx trains also accept the Niedersachsen-Ticket (Lower Saxony ticket), the Schönes-Wochenende-Ticket (“Nice weekend” ticket) and the Quer-durchs-Land-Ticket (“Cross-country” ticket)? Yes, these package deals are valid in the trains of the erixx GmbH. Of course you can take your bicycle on the erixx trains, provided that you purchased a corresponding ticket beforehand. The bicycle ticket costs €4.50 and can be purchased at all machines (Attention! Different regulations apply to the transport associations: HVV, GVH, VBN, VRB). Given that the spaces for bicycles are limited in erixx due to safety regulations, we recommend groups with more than 6 people to register in advance. In individual cases, taking a bicycle into the train can be excluded. In this case, we kindly ask you to take the next train. Can I use my disability ID in erixx trains? Yes, severely disabled persons with a valid ID and a respective token can travel free of charge in erixx trains. With a corresponding note, an accompanying person can also travel free of charge; the same applies to using first class. What do I do if the machine on the platform is not working? If a machine has a technical malfunction or the machine has been destroyed by vandalism and there is no other option of purchasing tickets at the train station, please note the machine number, location and time of malfunction. Please contact our on-board staff after boarding the erixx train without being requested to do so. If the ticket machine was demonstrably technically malfunctioning, you can purchase a ticket in line with an emergency sale on board (please observe, that there is only a limited selection available here). If it could be verified that there was no malfunction, the passenger will receive a payment request for a higher fare. I lost something. What can I do? Contact our Lost and Found and indicate as precisely as possible, what you lost (incl. description) and where. Meanwhile, your lost item may have already been found by our staff and returned to the Lost and Found. You can then pick up your lost property or have it sent to you; please observe, that the latter involves paying a fee. Can I also purchase my ticket on the train? No, our rule is, as is the case in all commuter trains in Lower Saxony: please purchase a valid ticket before starting your journey. Tickets are not sold in the trains. You can find more information here. Can I use my semester ticket in erixx trains? Yes, provided that an agreement was made for the purchase and use of the semester ticket of the respective general students’ committee (AStA) with the erixx GmbH. The semester tickets of the transport associations (HVV, GVH, VBN) can also be used in erixx trains however, only for the lines indicated. Can members of the German Federal Armed Forces travel for free with erixx? Military service personnel with a valid authorisation pass in connection with a valid military ID card can travel for free in standard class for journeys between their place of residence and post. No alcoholic beverages can be consumed in erixx trains or taken on board if the container is opened and, in particular, cannot be closed again (ban on consuming alcohol). Violations result in a penalty amounting to €40. I have a Rail & Fly ticket. Can I use it in erixx trains? The “Rail and Fly inclusive” ticket is accepted throughout the entire rail network. The “Fahren und Fliegen” (“ride and fly”) ticket is only accepted within the transportation associations.